In Flight from Berlin, Richard Denham inherits his love for and fascination with zeppelins from his father. The highlight of his press coverage of the 1936 Olympic games is flying into Berlin on the Hindenburg with a film crew. At that time, passenger zeppelins were mostly a uniquely German phenomenon having been developed in the late 1800s by German war hero Count Ferdinand von Zeppelin (1838  1917). The Count first encountered so-called lighter-than-air travel during his visit to the United States in the 1860s with permission from president Abraham Lincoln. The flight was aboard a coal-fired hot air balloon. Years later, after he retired from the army, he began work on a steerable balloon-type airship and developed his first prototype in 1898. It was only able to fly for about eighteen minutes covering three and-a-half miles. Zeppelin continued to work on perfecting his design, and in 1908 he made possible the world's first 24-hour endurance flight that gained him financial support from the German government. By the beginning of World War I Germany had ten zeppelins that were overseen by aeronautical engineer Hugo Eckener who also taught German soldiers how to fly the airships. They became invaluable military tools as they could silently approach unsuspecting targets on surprise bombing raids and flew beyond the reach of earthbound firearms. Airplanes were not sufficiently developed in those early years to be considered much of a threat. Beginning in 1915 Germany carried out airship bombing raids in England and France. Once airplanes took flight, as it were, the zeppelin's stealth bombing usefulness came to an end. One American airship, the USS Los Angeles ZR-3, made over 200 commercial flights in the 1920s and the Graf Zeppelin flew more than one million miles on almost 600 trips between 1928 and 1938. The Hindenburg (LZ 129), launched in 1936 as the Zeppelin Company's proudest achievement, heralded a short-lived era of luxury airship travel that ended in a fiery crash on May 6, 1937. In America, since the 1920s, the Goodyear Tire and Rubber Company has built and maintained a small fleet of airships, called blimps, for noncommercial or military service. 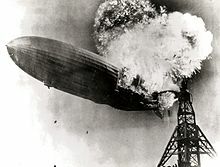 Present day blimps, are kept aloft by helium gas rather than the treacherously flammable hydrogen gas that propelled the likes of the Hindenburg skyward and triggered its tragic demise. This "beyond the book article" relates to Flight From Berlin. It originally ran in July 2012 and has been updated for the June 2013 paperback edition.